Hopefully the really cold nights are behind us. We had 20F last Wednesday night/Thursday morning 3/23. We are getting ready to transplant spring cabbage and broccoli. I wrote a bit about broccoli planting last spring (mostly about varieties and planting alyssum to attract beneficial insects) and in spring 2015. 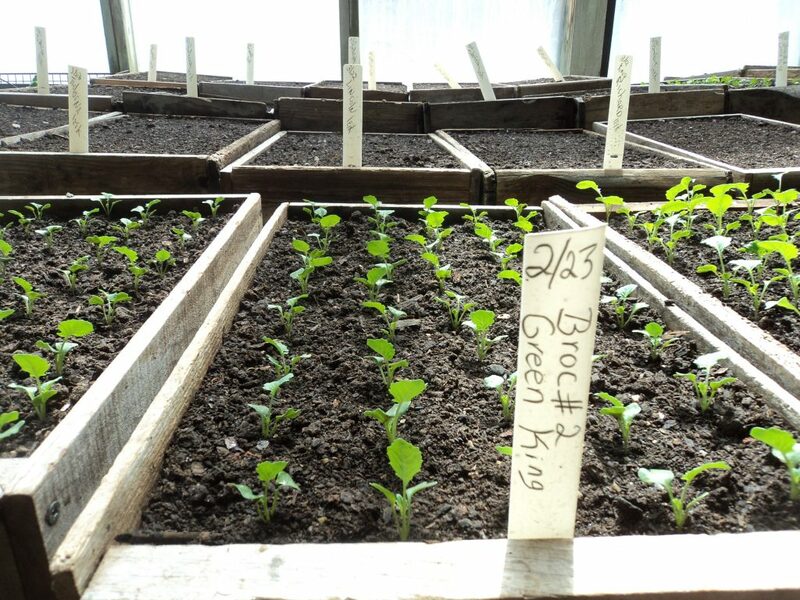 Flats of broccoli seedlings in our greenhouse in early March. 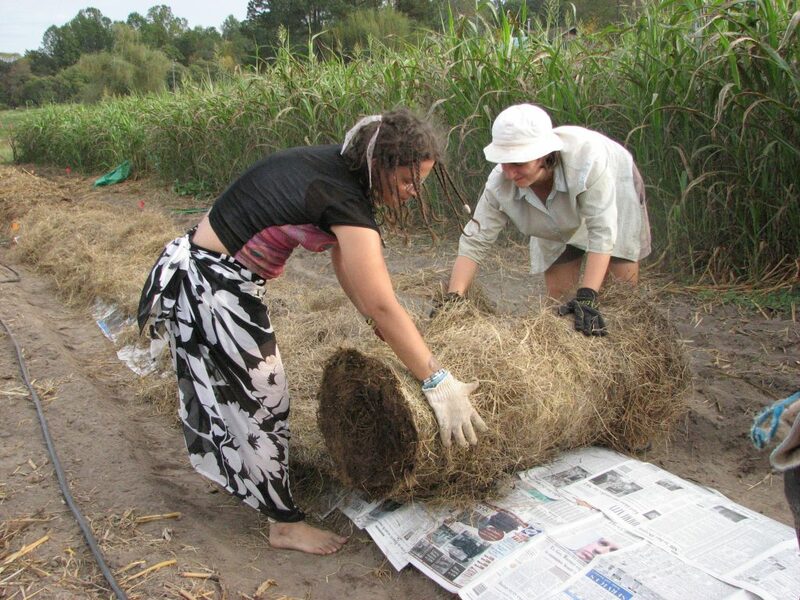 Here I’ll say more about transplanting into hay or straw mulch, which I have also written about for Mother Earth News. Transplanting into rolled out or pre-spread straw or hay from small square bales is quicker, easier and more effective than fitting the mulch around the transplants after you’ve planted them. We bale hay into big round bales, and move them around with the tractor and forks or a rear bale spike (spear). We plan our beds to be 5′ apart on centers and our rows to be 5-5½’ apart (tomatoes, for example) . We prepare our beds and get the mulch dropped off at the uphill end (even a small slope is helpful!). When we plant garlic in November, as soon as we’ve planted and covered the cloves with soil, we unroll the bales over the top of the beds. Using mulch helps control weeds, and reduces the weed seed bank, which is the name for the store of weed seeds already in the soil, that will otherwise grow in the future. 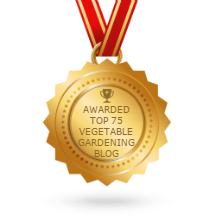 “One year’s seeding, seven years weeding,” is a wise and rueful gardener’s saying. Only perennial grasses and a few other “running” perennials will come up through a thick layer of hay. Plastic mulches, while they do deal with weeds, actually raise soil temperature. This is an advantage for warm weather crops, but not for brassicas! If using organic mulches for warm weather crops, it is often best to wait four weeks after transplanting, cultivate to remove one round of weeds, then roll out the mulch. This avoids cooling the soil which would slow growth down and delay harvests. If you’re waiting for watermelons, this is too sad! All kinds of mulch also reduce rain splash, helping prevent fungal leaf diseases. Organic mulches have some advantages over plastic mulches. They keep the soil damper, which can mean higher yields and less need to water. They also keep temperatures lower in summer, an advantage for cool-weather crops, like broccoli and cabbage. 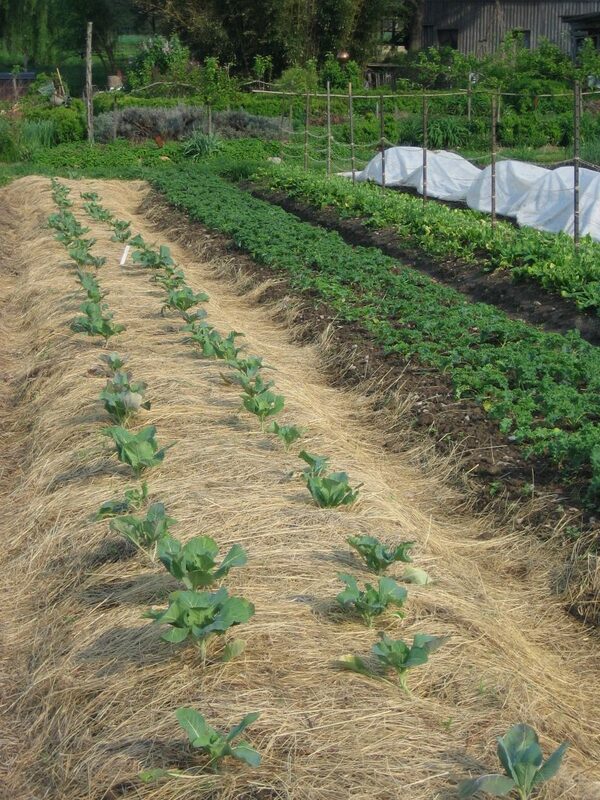 Organic mulches improve the soil structure and increase the organic matter. The number of earthworms in the soil at the end of the season can be twice as high as under plastic mulch. Rolling hay over newspaper for a new strawberry bed. There is a myth that organic mulches lock-up nitrogen from the soil. This could happen with soils which are very short on organic matter and micro-organisms. It does happen if fresh high-carbon sources, such as straw or hay, are incorporated into the soil. In my experience, surface mulches have not caused nitrogen shortages to the crops they mulch. Our soil is very fertile, and we do what we can to encourage soil micro-organisms to multiply, so that they can readily digest what we add to the soil. The longer-term effect of high-carbon mulches can be to increase the soil nitrogen. The micro-organisms feeding on the carbon die and decompose, and they are a high-N source! If you are buying in straw or hay and need to watch costs, you could spread the organic mulch over a double layer of newspaper. You’ll only need half as much hay or straw compared to mulching with the straw or hay alone. The final result is only half as deep, which is an advantage when transplanting small plants, which could get lost in deep organic mulch. I believe the inks used on regular newsprint are not toxic. We avoid using glossy paper with colored inks, because of concerns about toxicity of the coating on the paper as well as the inks. 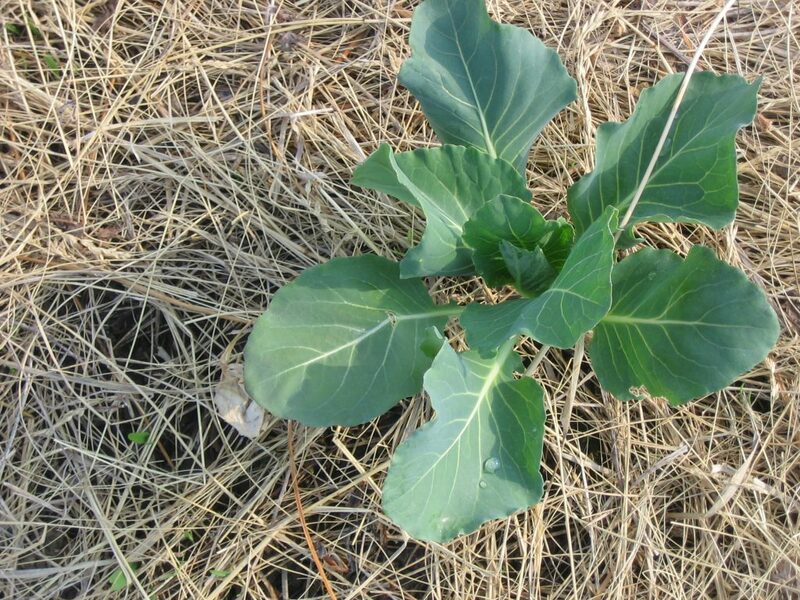 Spring cabbage planted in hay mulch, a few weeks after transplanting. We grow our own hay, so we know it is unsprayed – there is a danger from pyridine carboxylic acids, a class of broadleaf herbicides which persist through composting and even through the digestive systems of livestock, and can kill or seriously damage food crops and flowers. Grazon is one brand; picloram is the plant growth regulator it contains. Our hay is not the perfect mulch, as it does have some weed seeds, and sometimes mold. (Our garden gets the hay which is not good enough for the cows to eat.) If you have the choice, unsprayed straw is better than hay, as it won’t have many weeds. We don’t live in a grain-growing area, so there is no local straw for sale. We remove the twine (if it hasn’t already rotted and fallen off) and study the end of the bale to figure out which way it will unroll. This can be surprisingly unclear. If we have to turn the bale, or maneuver it to line up, we might have three people do that. Once it’s rolling, two people can manage to unroll a round bale of hay. We spend some time at the end using wheelbarrows to move hay from the thick places to the thinner spots. For transplants we do what we call “making nests” in the hay. Two people work opposite each other, across a bed, as we plant two rows of broccoli or cabbage. One of the people has an 18″ stick to measure the center-to-center plant spacing. The second person doesn’t measure, but staggers their row compared to the first person’s row, making a zig-zag to match the pattern. Both people aim to stay about 16″ from the edge of the bed, so the rows are evenly spaced across the bed. Using two hands, they pull open the hay, down to soil level. The “nest” needs a diameter of about 4″, for easy transplanting. We either make all the nests before we start planting, or we have two pairs of people, with the nesters moving faster than the planters. We want to get the plants in the ground quickly, and minimize the time they are out in the field wilting in the flat. Each planter works along a row, transplanting into the exposed soil in the nests, firming the plants in and watering from a can every 10-20 plants (depending how hot or windy it is). Another crew member pulls the hose and wand along the aisles and gives all the plants a generous second watering. After the hose watering, someone pulls the hay around the stems at ground level.We call this ” tucking the plants in”. If plants are “untucked”, this is the signal to the Hose Waterer that the plants need water. When they are all tucked in along a section of a bed, it is the signal to those unrolling row cover to go ahead and cover. Our system is almost disaster-proof, as it includes indicators about the next task needed. To have a long broccoli harvest period, we use several varieties with different days-to-maturity, and two sowing dates. This gives us the longest possible harvest period before it just gets too hot for pleasant-tasting broccoli. A bed of early spring cabbage, planted into hay mulch. 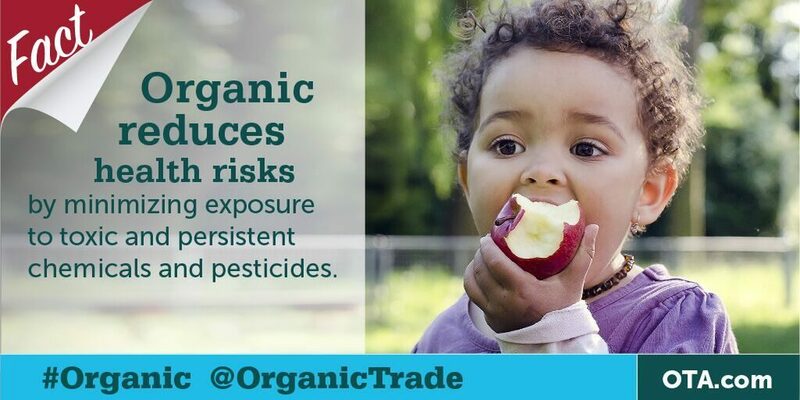 The Organic Trade Association has published a set of 33 little posters putting solid information out there, and busting some myths about organic agriculture . Here’s one with a photo on our cabbage theme. The items are free to download, for any healthy food related events you might be organizing. Or just go and read them, so that next time someone asks you a question about organic farming, you’ll have the answers at your fingertips. And talking about what’s allowed in Organic certification, one controversial practice is hydroponics, where plants grow without soil, in a liquid including nutrients (the nutrients people are aware the plants need). Another is aquaponics where plants grow without soil, in a liquid where farmed fish have been growing. “The NOSB needs our help. 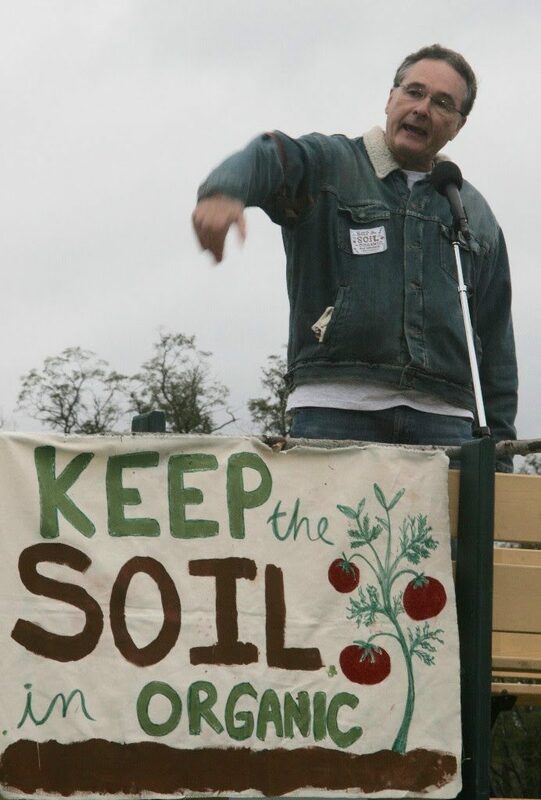 The NOSB meets in Denver in three weeks to debate whether a healthy soil is the foundation of organic farming. We have champions on the NOSB fighting for us, but they need to hear from you. They are facing tremendous pressure from professional lobbyists in this battle. Lee Frankel, one of the chief lobbyists for the hydroponic coalition, stated in an editorial last week that organic hydro is now a billion dollar a year industry. This explosive growth happened in just 7 years since the NOSB recommended that hydroponics has no place in organic certification. That recommendation was opposed by the USDA, and hydro has been welcomed into organic certification. The hydro industry sees organic as their economic gold rush. And they are only getting started. 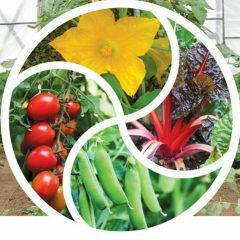 Please submit a comment to the NOSB (National Organic Standards Board) letting them know that organic must be based on the fertility of a healthy soil ecosystem. 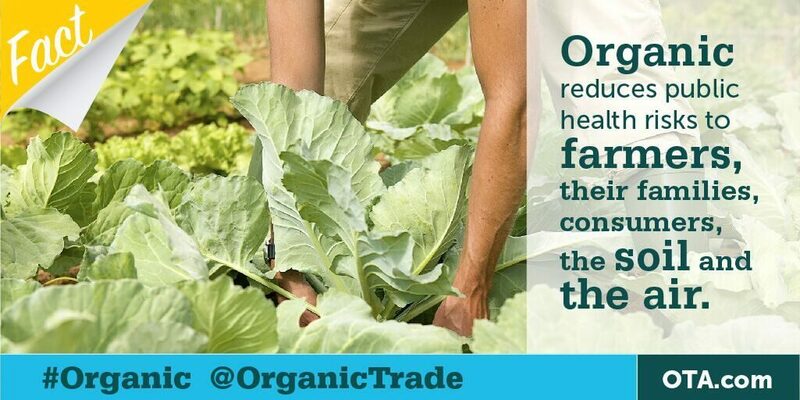 Don’t let organic be destroyed. Comments are due by this Thursday 3/30 at midnight. Do it now. No time to lose on that one! Big hydroponic “organic” industries have lobbied and got included as certifiably Organic, when most of us realize that growing food without soil is the opposite of Organic, with or without a capital O.
I’m one of the unfortunates with perennial grass (in my case, wire grass) coming up in my garden. How the heck do I get rid of the stuff without poisoning my soil and my garden? The space is just too large to pull, pull, pull, and I’m afraid of it getting away into the wooded space around us. Any ideas? Yes, wiregrass, isn’t it awful? Bermuda grass is its official name if you want to gather more info. It likes warm weather, doesn’t like shade, so I don’ think it will grow under your tress. It hasn’t invaded our woods. You might try thick black plastic for a few summer months. And start digging! Stop it spreading further. Work inward from its edges. Or till frequently. Although this isn’t recommended as far as soil structure goes, it does work to defeat wiregrass. Read up about sustainable weed management. With “wandering” perennials, there is a point at which pieces of rhizome won’t regrow. It’s called apical dominance. The main growing point suppresses other potential growing points along its length. Cutting rhizomes up once into small lengths will cause most of the small lengths to start growing. But if you till again in a week, you can stop those new plants really getting going. I haven’t got the precise details in my head, and I have a lot of lettuce plants to deal with this morning, so I’m stopping at that for now. Thanks – I’d forgotten about apical dominance. I was going to till it all up this spring anyway, and will just till two or three times and hope it works. (And I’m thinking heavy cardboard down the pathways between the rows, to kill it there, too.) Thanks for your time! When transplanting, I water the transplants well a few hours beforehand. Then I always dig the holes first, fill them with water and wait for them to fully drain then plant/transplant. If conditions are very dry, I will fill with water/let drain twice. That puts the water right in the root zone where the plants need it. It takes hours for surface water to penetrate down to the roots. By transplanting moist transplants into moist holes you can pretty much guarantee success – they don’t even seem to know they have been moved! I do turn on the soaker hoses after planting, but that is immediately more for ensuring humidity around the plants’ leaves to lessen excessive transpiration…then over time to even out the moisture content of the bed. You can use this method to transplant peonies in bud (really!) or plants in full flower…they don’t even notice if conditions are right – overcast, humid, not windy, not hot. Oh yes, I do agree that moist soil and pre-watered plants survive best. Our soil isn’t as free-draining as yours, from the sound of it. When I first moved here, I almost drowned a row of tomatoes by watering them the amount the soil at my previous home needed! I used to count to ten for each plant, here I count to 4 or I just estimate. After 25 years I don’t need to count to four!